Viewing in the week is between the hours of 9.30am and 5.30 weekends and bank holidays are by appointment only. Welcome to Cherished Classic Cars Ltd. We specialise in buying and selling quality classic vehicles, We try to provide the best original or restored cars available. 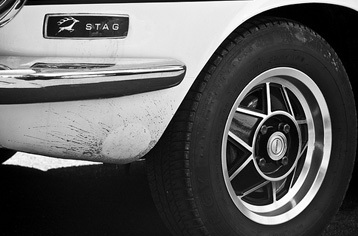 Our speciality is the Triumph Stag, of which we normally stock at least ten vehicles. Lee Cort has hands on knowledge and many years experience in the motor trade.Lee has 20 yrs experience with the Triumph Stag, so there is very little he doesn’t know about this 4 seater convertible. We have at least 10 outstanding Triumph Stags always in stock, we also have a varied collection of other classic vehicles including such Marques as Austin,Fords,Jaguar,MG, and many others. All our vehicles that are ready for sale come with a detailed engine compartment, wheels polished or refurbished, chrome work replaced or re-chromed, and fully valeted inside and out. We commend ourselves on having some of the best presented cars available, so you the customer can just enjoy and drive. Before collection all vehicles have pre delivery inspection at our workshop, they are serviced, the lubricants are changed, all levels are checked and a 12 months mot applied. We are located in Leicestershire, M1 junction 21A follow the A46 to the Hobby Horse Island at Syston stay on the left hand side follow filter to the left you will see sign post direction to Newarke on the A46 approx 5mls take the A6006 turning left to the junction turn left on to Paddy’s Lane follow the road under the A46 for half a mile,the turning for Lodge Farm is on the left hand side. © 2011 Cherished Classic Cars Ltd. All rights reserved.